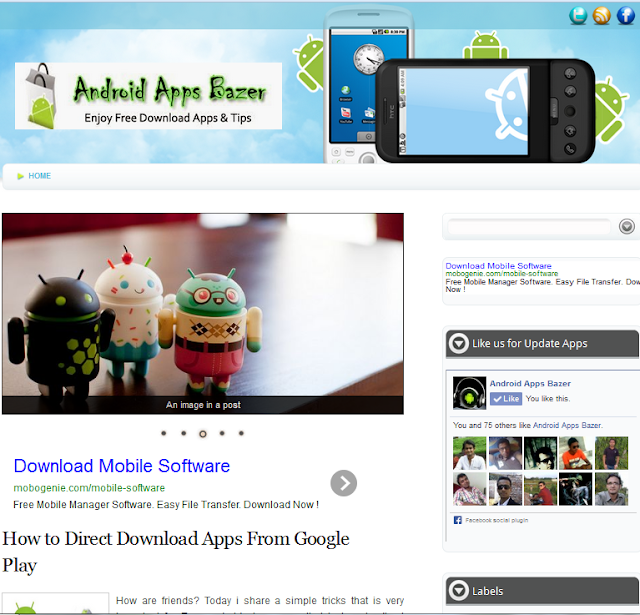 Now a day Android Apps is popular topics to blogger so many blogger are fail to find out expected blogger template on Android Apps.Today i share with you new awesome responsive blogger template on android apps. 02.Auto design label & popular post widget . 04.Design related to android apps or phone. in the below i share the picture of this template and download link so download and upload your blogger in template option & enjoy your android blogging. Dear friend templates choose is the very hard for us because we cannot get proper template what we want; now a day’s demand of Responsive SEO Friendly Blogger Template is very high. So I share a blogger template this very nice an awesome, I thinks every one like it because it has a lot of features and fully readymade. 06. Nice read more button, sharing widget, Heading 1, 2, 3 & Block quot. 08. Nice Design & SEO Friendly. 09. Responsive & Google Adsense Friendly. 10. Increasing visitor browsing duration. So I think you have not added or invest time behind this blogger template for editing. This blogger template is perfect for newbie blogger because they want design but have not sufficient knowledge for editing. Most of blogger search template on movie review but they don't choose it.Personal i use a blogger template on movie review.I think you can like this free SEO friendly blogger template on movie review. There are thousand of sites or blogs from where you can collect any template but here i have shared a collection of premium SEO optimized and adsense friendly blogger templates. I have collected 10 best template from different website,that are good for your blog,nice designing,seo friendly,responsive and adsense friendly.Now am show you those template below and you can free download from here.Now you thinks that why i use premium and SEO Optimized blogger template.ok that's fine i answer your question. Why you use SEO Optimized Premium Blogger Templates? Premium Blogger template are looked very nice with great designed,beautiful,eye cashing, it outlook is awesome with easy navigation menu, brilliant ad spaces to generate more income,related posts widget and many more.SEO Optimized means search engine friendly so with out visitor your blog have not value,If you blog designing SEO friendly more visitor you get by navigation menu,social share options, related posts widget, recommended article links and many more and they stay long time. Top 10 Premium SEO Optimized and Adsense Friendly Blogger Templates, It's Photos, See demo and Direct download option is also included for that reason you may see the live demo of it and download it what your need.